When you are in middle school, it is a dumb idea to expect good things to happen to you. After an unfortunate incident at the hair salon, Bessica's not allowed to see her best friend, Sylvie. That means she's going to start middle school a-l-o-n-e. No one to walk or eat lunch with, study or text with. Bessica feels like such a loser. She wants friends. She's just not sure how to make them. It doesn't help that her beloved grandma is off on some crazy road trip with her new boyfriend and has zero time to listen to Bessica. Or that she has a ton of homework. Or that gorgeous Noll Beck thinks she's just a kid. Or that she's made an enemy of the hall monitor. Or that there are some serious psycho-bullies in her classes. Bessica soon realizes that you can't have everything you want in middle school . . . and if she doesn't make good choices she won't have anything. Cheerleading? Instant friends. Alt crowd? Exiled to loner town. Yearbook? Chorus? School mascot? Bessica doesn't care about being popular. She just wants to survive -- and look cute too. Is that too much to ask when you're eleven? Sixth grade means opportunity to Bessica Lefter, who's excited about the wide new horizon before her. She's appalled, however, to find that other people are looking to their own new possibilities -- that her best friend and loyal, malleable sidekick Sylvie is being sent to a different middle school, and that her beloved grandmother is heading off on a six-week jaunt with her boyfriend. Instead of leaping on to the sixth-grade scene as she had envisioned, Bessica finds herself slinking around friendless; she's therefore desperately trying to slot herself into a redeeming social category, especially hoping to reach the pinnacle of success - the cheerleading squad. Bessica's voice is funny, goofy, anxious, and absolutely emotionally authentic: she's visibly self-absorbed from the get-go as she bulldozes Sylvie without a second thought, and it's utterly credible that she's stunned to find the change she'd anticipated could happen to people other than herself. There's plenty of real understanding, though, about Bessica's predicament, and the book poignantly (albeit humorously) depicts the painful irony of finally getting your own cell phone - and having nobody to talk on it but your mom. It's that kind of offhand believable detail at which Tracy excels, setting Bessica in a teeming middle school where things happen to everybody, not just the protagonist. Bessica's crude, desperate negotiation of social strata (she's horrified of being classified as - well, somebody like her) reeks of preteen developmental reality, as does the fact that it takes some serious knocks and straight talk before she lets go of her preconceptions and accepts a satisfying niche (as the playful team mascot) instead of torturing herself over an imaginary one. Readers negotiating their own middle-school minefields or soaking up all the preparatory information they can find will breathlessly follow Bessica's escapades. Bessica Lefter looked forward to middle school until a rash decision to get matching pixie haircuts led to her having to negotiate the new school entirely on her own, without her longtime best friend Sylvie. Well-meaning adults and former students give her conflicting advice. On her own she finds it hard to avoid the psycho-bullies and make new friends. Eating cookies from the vending machine in "loner town" had not been her plan. On top of that, her grandmother and best ally has gone off on a trip in her new friend Willy's motor home. One subplot revolves around Bessica's use of an online-dating service to find her grandmother a more suitable friend. Another involves Bessica's efforts to join the cheerleading squad, although she doesn't like to be upside down. The first-person narration reveals the inconsistencies of preteendom, the magnified problems and rapid emotional swings. Both family and school are believable, but, appropriately, this is all about Bessica, a character whose newfound bear persona schoolmates and readers alike can applaud. Bessica Lefter is starting middle school with big problems – her best friend transferred to another school at the last minute, her grandmother has run off with her boyfriend in a motor home, she's starting school not knowing one other person, and has a brand-new pixie haircut that kicked off all her problems. This is a story about the perils of middle school, with a strong and irresistible protagonist. Bessica Lefter was named after the real-life Bessica Raiche, the first woman to pilot a solo flight. Raiche built a plane in her living room from bamboo and silk and bicycle wheels. She was an interesting and plucky character, a fitting namesake for the fictional Bessica. Author Kristen Tracy addresses the horrors – bullies, lunch seating, malfunctioning lockers, P.E. – with engaging humor. Bessica plunges into everything she does with a hapless and desperate passion. She bumbles through her first week of school, and anything that can go wrong, does. Her locker won't open, she has pens when she's supposed to have pencils, and overwhelmed by the daunting lunch scene she sticks to vending machines which, in an unfortunate comedy of errors, lands her in the principal's office. Bessica inadvertently fails to heed every bit of advice the well-meaning Docker twins armed her with – i.e., steer clear of the alt crowd, Dolan the Puker and psycho-bullies. Still, she keeps coming back. Bessica’s determination is infectious, and courageous. Faced with one humiliation after another, she manages to triumph, and it makes the ending that much more of a payoff. Tracy uses just the right touch of humor to keep the story fun, yet still take seriously some painful side effects of growing up. 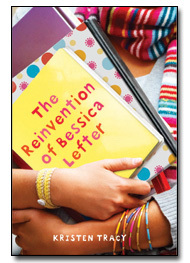 The Reinvention of Bessica Lefter was released in hardcover on January 11th, 2011. Recommended for ages 9 and up, grades 4 and up. But wait! There's more! Check out the next book, Bessica Lefter Bites Back.